For a variety of personal reasons that I won’t go into here, 2013 has been a horrible year that I’ll be glad to put behind me. Even the things that, objectively, have been positive, have been tainted to a greater or lesser extent by the negatives, so this is not a year I’m going to look back on fondly. On the other hand, I’ve read a lot of good books. So in the great tradition of end-of-year lists, here’s part one of the Chimney Rabbit Best of 2013. I’m splitting the list into three categories – children’s books, adult books, and comics. Part one is comics – and by comics I mean web comics, printed comics, graphic novels, and manga. Aaron Diaz’s Dresden Codak is one of the most inventive and visually stunning web comics being produced today. Even with a production schedule that makes Donna Tartt look like a workaholic, the comic manages to retain a dedicated audience through its sheer high quality. 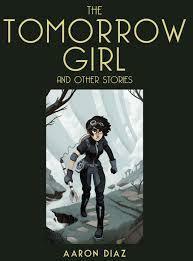 The Tomorrow Girl is the first printed volume of the web comic, and was funded through a Kickstarter that asked for $30,000 and raised an extra half million dollars on top of that. The gold edition – the one I plumped for – is a huge, glossy, hardback, slipcased edition that I have no idea how to store. It’s propped up against a wall in its cardboard packaging – there is no bookcase in existence that can hold it. Reading the volume is an experience, even when you’ve read all the individual pages before on the website. A cheaper edition is available, but the way I see it, if you’re going to get a book like this, you might as well go all the way. OK, this looks bad. It’s a superhero comic. Except it’s not. 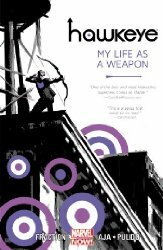 Hawkeye (story: Matt Fraction, art: David Aja) is the chronicle of the monthly adventures of what Hawkeye, the archer from The Avengers, otherwise known as Clint Barton, gets up to when he’s not saving the world with Earth’s mightiest heroes. More of a comedy adventure than an adventure, it relies on comic timing, slick dialogue, and neat characterisation for its appeal. Issue 11 is the high spot – an entire issue told through the eyes (and nose) of Clint Barton’s dog. If you only read one superhero title this year, make it Hawkeye. 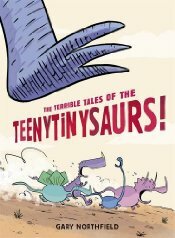 Gary Northfield’s Terrible Tales of the Teenytinysaurs! is a comic romp for younger children that appeals enormously to 40-somethings who’ve managed not to grow up. A group of young dinosaurs get into trouble in the way that only young dinosaurs can, all depicted through Gary Northfield’s utterly exuberant drawings. There are dinosaur poo jokes and crazy adventures, with a highlight being the delight of the huge double-page spreads that are just packed full of detail. The beach scene is like Where’s Wally with dinosaurs, and the undersea scene is just jaw-dropping – almost literally. How often do you turn a page in a book and just say “wow”? 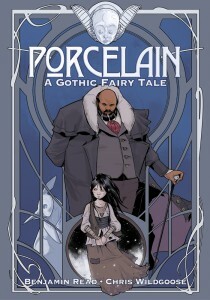 Porcelain is a stand-alone graphic novel that, in its 96 pages, tells a rich, moving, inventive, and fascinating story with utterly beautiful artwork. There’s a certain steampunk aesthetic to the book, with porcelain automata roaming the grounds of the mysterious mansion. There’s forbidden knowledge and deep secrets and a touching relationship between the old automaton maker and the street child who breaks into his home. Beautiful art, and a wonderful story. A delight. In my opinion, John Allison is the finest writer of comics in Britain today. His work at Scary Go Round goes back to 2002, and his first comic, Bobbins, dates from 1998. It’s still a mystery to me why he’s not been made our Comics Laureate yet. I loved Scary Go Round, with its mad devil bears and crazy goblins and slapstick demonic forces at work in a West Yorkshire town, but it’s Bad Machinery, the story of two loosely-affiliated groups of boy and girl detectives, that’s his masterwork. In The Case of the Team Spirit, the first printed collection, there are strange goings-on at Tackleford City FC, with Shauna, Charlotte, and Mildred taking the side of Mrs Biscuits, the old Russian woman whose home is being threatened with demolition to make way for the new stadium, while Jack, Linton, and Sonny investigate the mysterious curse that threatens their beloved football club and its Russian owner Mr Kropotkin. Are these two cases related? Of course they are! But not in the way you think. The dialogue sparkles. I’ve no idea if kids talk like John Allison thinks they do, but by heck I wish they did. The humour arises partly from the ridiculous situations, but mostly out of the interaction between the characters – they bounce off each other brilliantly, sometimes gently taking the piss in the way that kids do so well, sometimes tipping over the edge into active feuds. The complex web of friendships of schoolkids has never been so well depicted. Volume 2 is out next year. There’s a good chance it’s going to top my list for 2014.